If you can't beat him, trade for him. One of the takeaways from the first day at the 2018 NFL Combine after listening to Howie Roseman and Doug Pederson is that the Philadelphia Eagles seem to be open for business if teams were to offer trade proposals for Super Bowl MVP Nick Foles. Mailbag: Who are the Eagles' starting corners in 2018? When asked about whether or not the Eagles would include Foles in any trade conversations, Pederson said that the team wouldn't "blindside" him, thus acknowledging that a trade was a possibility. How do I know the Cardinals would be open to trading for a quarterback? Well, their head coach and general manager said as much on Wednesday. As we noted, they literally don't have a quarterback, like, at all. They also pick at a spot in the first round (15th overall) where all the best quarterbacks prospects will be gone, and they don't have the same type of cap space as teams like the New York Jets and Minnesota Vikings, who are both expected to make strong plays for Kirk Cousins in free agency. The Cardinals have four picks in the first three rounds. The Cardinals hired general manager Steve Keim in 2013. In his first three years as GM, the Cardinals averaged 11.3 wins per season. In 2016 they went 7-8-1. In 2017 they went 8-8, with the oldest roster in the NFL. If the Cardinals go into the tank, Keim could be out of a job. Teams that go, say, 4-12, that don't have either a good veteran quarterback or a young quarterback to get excited about for the future tend to fire their decision makers. As both Keim and head coach Steve Wilks noted, the Cards want to add a veteran quarterback, and a young quarterback to develop. Foles would afford the Cardinals the ability to stay competitive in the short term (aka helping Keim's job security), and maybe the long term if he can continue his great play in the playoffs can carry over into 2018 and beyond. As we noted above, the Vikings have a lot of salary cap space. According to OverTheCap.com, they are projected to have around $48 million when the new league year begins on March 14th. They are rumored to be heavily interested in pursuing Kirk Cousins when free agency begins. Unfortunately for the Vikings, they have competition. The Jets have a whopping $90 million (projected) in cap space after releasing Muhammad Wilkerson on Wednesday, and they are desperate for a quarterback, as Manish Mehta of the New York Daily News points out. With a very strong defense and quality pieces on offense, the Vikings clearly provide a situation more conducive to winning than the Jets, but the Jets can pretty much outbid anyone for Cousins' services. Like the Cardinals above, the Vikings don't have a quarterback under contract, at all. Should the Vikings lose their face off with the Jets (or maybe even the Broncos), they could consider trading for an Eagles quarterback for the second time in three years. That 30th overall pick would be tough for the Vikings to part with. 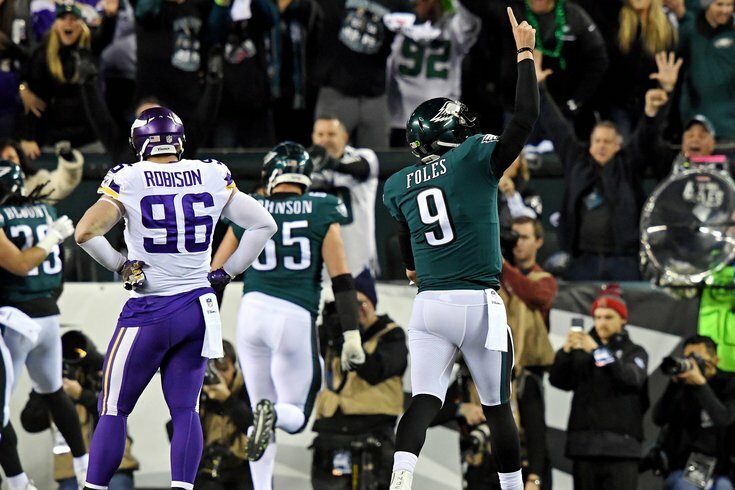 Still, the Vikings proved they could win in the regular season, but needed a miracle to get through their first playoff game, before getting blown out by the Eagles in the NFC Championship Game. Obviously, new Vikings offensive coordinator (and former Eagles QB coach) John DeFilippo helped find ways for the Eagles to succeed with Foles after Carson Wentz was lost for the season. The Vikings could feel that DeFilippo can coax similar results out of Foles in Minnesota in games that really matter. Working against this possibility is the idea that the Eagles will not want to strengthen a conference rival that they just faced to get to the Super Bowl. Personally, my read is that the Cardinals and Vikings are the top two logical landing spots for Foles, by far, and then there's a wide gap. The argument for the Bills is that they have a quarterback in Tyrod Taylor that they can say they believe in all they want, but the reality is that their actions (benching him for Nathan Peterman last season, for example) say otherwise. The Bills are also loaded with a high draft picks. The Bills certainly have ammo to trade for Foles, whether that be with one of their two first round picks, or some combination of one of the their second round picks, and change. Of course, with that ammo, they also have the ability to package picks to move up for a quarterback in the draft that they can begin to build around for the long term. Working against the idea of Foles to the Bills is the fact that Foles played horribly in very cold weather games against the Raiders and Cowboys to close the regular season. That would be concerning to me if I were the Bills. If the Jets do indeed go hard after Cousins, that would signal that they don't like their chances of finding a long-term quarterback in the draft at pick No. 6. Could they then turn their attention to Foles if they come up empty? With their $90 million in cap space, paying Foles in a contract extension would be no issue. Ultimately, however, the Jets have nothing on offense. While Foles can clearly win when he has some pieces to work with around him, I don't believe that the Jets represent an organization where he would be set up well to succeed. The Broncos are a little bit like the Vikings, in that they have a lot of talent on defense, even if the Broncos' D had a down year in 2017. They can still compete in the playoffs with that defense, provided they turn it around in 2018, but they're going nowhere without a better quarterback. Using the same logic as we did with the Jets above, if the Broncos go hard after Cousins but come up short, that will signal that they don't believe there is a slam dunk quarterback that they can have at pick No. 5. So if not Cousins, why not Foles? The short answer, obviously, is that Foles will cost something close to the Broncos' 40th overall pick, and John Elway doesn't like giving those up.